Chart Yer Moods! Just A Little Plotting and You’ll Figure It All Out! Guaranteed or Money Back! There is an unhappy person in my head. It might be my head. It might be half my head, half my brain might be unhappy. I know, I know, you say, “Everyone gets unhappy. the rest of us are either giddy or depressed all the time. What was it she called me? oh, no – anxious. She says I suffer from anxiety. 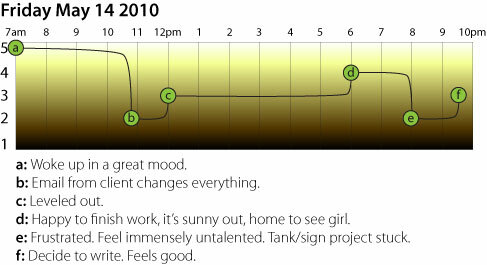 I’m going to chart my moods. 1 being seriously depressed, 5 being ecstatic.